It's understandable that some children appear bored or distracted during sacrament meeting. Many young Latter-day Saints are probably unsure about the true meaning of the sacrament and why we attend. With this in mind, bestselling author John Bytheway has composed a delightful poem (inspired by a short poem by Walter H. Horne) to help Latter-day Saints young and old appreciate the ordinance of the sacrament. In particular, children will learn what they should be thinking about (and not be thinking about) during this sacred time as well as what the sacrament can do for all of us. Beautifully illustrated by Nathan Pinnock, this thought-provoking story about a young boy and his grandpa is a gentle reminder about the importance of remembering the Lord Jesus Christ, especially during this special meeting meant for Him. It's been twenty years since John Bytheway started publishing with Deseret Book Company. However, this is the first time that his name will appear on a children's picture book. For years, John has used a poem during fireside talks to help LDS families understand the importance of the sacrament. With full-color illustrations by Nathan Pinnock, The Sacrament will help children of all ages understand what they should be thinking about during this sacred ordinance. John shares the story of a by and his grandfather and the memory the grandfather shares with his grandson regarding the lesson he learned about the sacrament when he was a young boy. Sacrament meeting is such a tricky time when you have young children and as a mother I am always grateful for books that help make it easier. 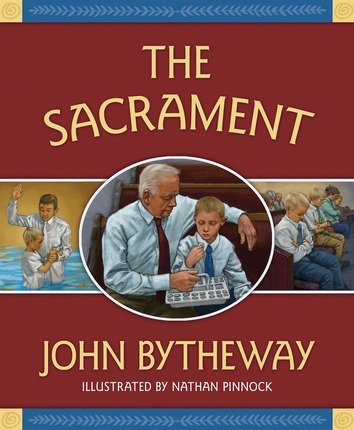 The Sacrament by John Bytheway explains the importance of remembering the Savior and the covenants we make at baptism in words and illustrations children will understand. The story of a young boy staying at his grandpa’s house who feels bored in the chapel while the bread and water comes around. Grandpa describes that he once felt the same way, but as he looked around, he noticed how many others were not paying attention. There’s the boy with the gold star on his forehead and socks off that we find in both Grandpa’s ward and the present day, as well as fun, almost hidden silly things dispersed through out the pages. A garden gnome peeking out on grandpa’s front lawn and a grandma my kiddos were a bit scared of on the first page. But the tone changes from silly to serious as the boy begins to understand how different the congregation would be if Christ were there himself. We loved The Sacrament! It’s fun to see John Bytheway breaking into children’s books and I am so thankful to have another well written book with explanations of the symbols of the sacrament to add to our quiet bag. John Bytheway is an instructor at the Brigham Young University Salt Lake Center. He served his mission in the Philippines and earned a master’s degree in Religious Education at BYU. He has published dozens of books and audio programs and lives in Salt Lake City with his wife, Kimberly, and their six children. Nathan Pinnock studied at Utah State University, the University of Utah, and Atelier LeSueur in Minneapolis, Minnesota, and he earned his Bachelor of Fine Arts in Illustration at Brigham Young University. Between years of school, Nate served a mission in Frankfurt, Germany. He illustrated books and magazines for fifteen years and now spreads his time between his illustration, sculpture, fine art, and teaching. He is a creator. His paintings and books can be found in galleries, businesses, and homes across America. Nate lives in Holladay with his wife, Alison, and kids.